The weekend in Moscow was very warm. As I came to visit from the Western Ukraine I got immediately introduced to the latest spring fashions: fishtail shirts, hot pants, gladiator sandals and red pedicure. Within a couple of days I saw a lot of takes on all these trends - Moscow is such a people-watching place after all. Bizarrely enough just as big the city is in terms of fashion as much it is lacking in gastronomy. Seriously, what's the point in the red pedicure if you can't eat well? I miss Turkey or Morocco or Italy or pretty much anywhere in the world where you can walk in any place and get a decent meal. Moscow is doomed in that sense: as a visitor I would never rely on a "walk-in" principle and would only go with good recommendations. The majorly of places for common folk serve really mediocre food and many upscale places do to. So I was spending my time sharing meals at Correa's, Moscow chain of US-born chef Isaac Correa, always full of gastronomic revelations, and Le Pain Quotidien, a Belgium chain of bakeries famous for their communal tables and delicious bread and pasty. And I cooked at home. I got really inspired by all these spring mouthwatering recipes of artichokes and asparagus but my sally to a nearby large supermarket proved very discouraging. Not a single sign of either! Instead, I spotted a premium spinach imported from Italy (I could never understand how Russia can import such stuff given its vast agriculture lands) and tomatoes without any smell. So, I've decided to go with a good old principle - see what's fresh today and cook it. Necessity is the mother of invention indeed: I've picked a few items and come up with this fresh delicious spring pasta salad. The slightly fried chickpea sprouts go really well with juicy vegetables and pasta – and the seasoning based on green Tabasco is a must to try. Enjoy! Cook pasta to al dente (9-11 minutes for penne). Use a pasta colander to drain the hot boiling water and set it aside. In a small bowl make the dressing by combining olive oil, green Tabasco, lemon juice, salt and pepper. Do not add the honey yet. Preheat a frying pan and oil it with one table spoon on the dressing. Put the chickpea sprounts in the frying pay and vigorously shake every 30 seconds for 3-4 minutes till the sprouts start browning. Set the chickpeas aside to cool down. 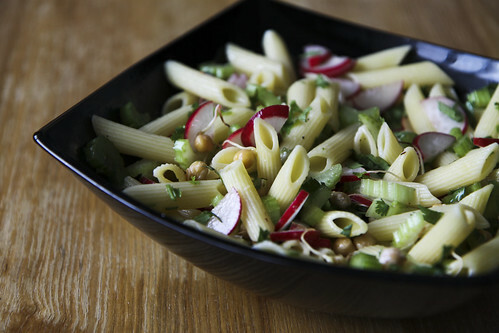 In a salad bowl mix chopped celery stalks, garden reddish, pasta, coriander and the chickpeas. With a fork mix in honey to the dressing and add the dressing to the salad bowl. Cover the bowl with a flat plat and shake up and down for a few seconds. Juicy and springy the salad comes ready for serving! neat salad- so balanced and colourful!